With your help, we’ve just filed an incredibly important lawsuit. How would you feel if you received an email that began this way? This sentence serves as both the subject header and the first line of my most recent correspondence from Southern Poverty Law Center. 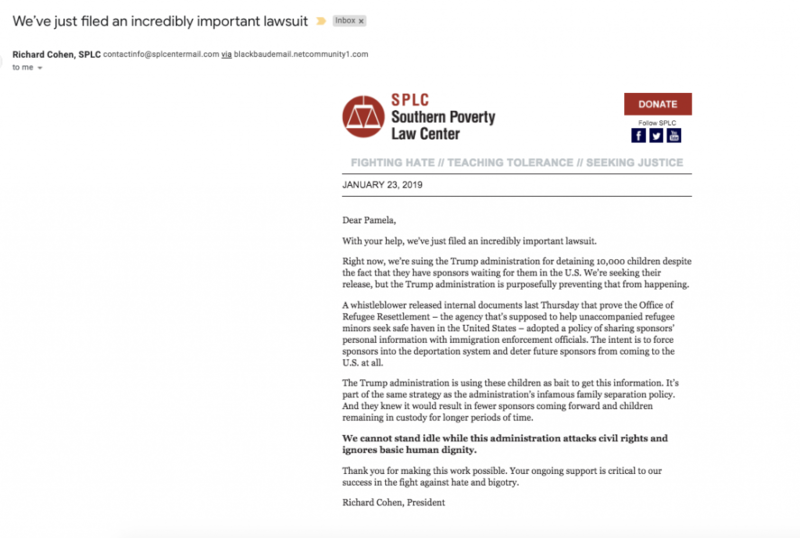 SPLC is a very important organization, and right now, they are performing work that is truly vital. Their work is important because of the nature and timing of it. It is important work because I, and countless others, care. Richard Cohen, their president, speaks directly to me by name, telling me that their most recent success happened because of my help. The language used throughout this email is part of what makes it so memorable, and it’s why I wanted to showcase it. Their message, which comes through loud and clear, really resonated with me. Plus, they made me feel like a true partner in their mission. Together, we’re fighting the good fight and bringing hope during a time of chaos. We have a shared understanding of what is happening in our country and how blatantly wrong it is. We’re motivated by this knowledge, as well as feelings of upset and anger, and we share a desire to fight back against it. We cannot stand idle while this administration attacks civil rights and ignores basic human dignity. Yes. We value basic human life and dignity. Sadly, we’ve witnessed how these things have been clearly disregarded. SLPC has highlighted a recent success and managed to inspire emotion in me, but they’ve also stuck to cold, hard facts that can’t be ignored. The language is clear, concise, and impactful. Check out the entire email message below, and notice the great options below the message, which take the form of gray buttons. Previous post: The Power of Storytelling | Meet Chris: husband, father, rower, and blind architect!